Shop Our Other Items >. 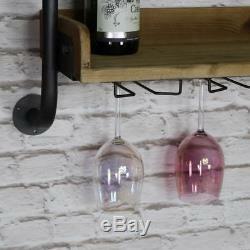 Rustic Wall Mounted Wine Bottle and Glass Rack. 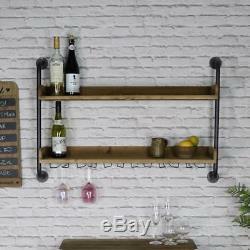 Make sure your favourite tipple is safely stored together with a glass with this wall mounted bottle and glass rack. Wonderful rustic, industrial style that will look perfect in a modern, contemporary or country kitchen. Two large shelves that will easily hold your standard size wine bottle, spirits or soft drinks with 6 handy glass hooks underneath, just what you need to for quick and easy access after a hard day! Of course this doesn't have to be used as just a wine rack, a great idea for the man cave or shed for tools and DIY equipment. Two wooden shelves in a natural wood finish held together with 2 grey metal brackets and 6 metal glass holders under the bottom shelf. Each shelf measures 89.5cm x 7.2cm x 23cm (width x height x depth) with 30cm height between. 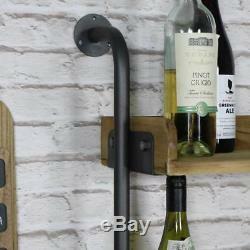 Easily wall mounted with the brackets each requiring 3 screws to secure to the wall (not supplied). Looking for a way to organise your home or work place, we have a great range of storage solutions that will suit any decor. From wall shelves to floor standing shelves in wood and metal, from the vintage, shabby chic to the retro, rustic and industrial. Material(s): Wood / Metal. 99cm x 67cm x 24cm (width x height x depth). Welcome to our Windsor Browne e-shop! Customer service is our number one priority, if you have a problem with your order or if you think we can improve anything, let us know and we will try and learn from it. We always treat my customers as I would wish to be treated myself. I personally take the most pleasure in sourcing and adding new lines to this website. I promise to add new products on a regular basis, so keep visiting our site so there is always something new for you to see each time you visit. At Windsor Browne, we hope you will agree we have lots of beautiful things! Sourced from around the world, with a distinctly French, Vintage & Rustic Chic look. We have a fabulous team of dedicated staff all of whom are nice people who love being helpful and talking about our stuff! We really value your custom and hope you enjoy our shop! We will also advise you on the day of dispatch that your order has left us. They deliver Monday- Friday between 7am -6pm. They are able to leave items with Neighbours or in a safe place, if you wish. These terms and conditions do not affect your legal rights. The item "Rustic Wall Mounted Wine Bottle and Glass Rack" is in sale since Tuesday, June 26, 2018. This item is in the category "Home, Furniture & DIY\Furniture\Bookcases, Shelving & Storage". The seller is "windsorbrowneonline" and is located in DN11 8BZ. This item can be shipped to North, South, or Latin America, all countries in Europe, Australia.